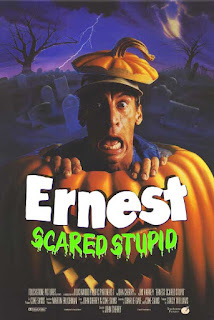 On this week's episode, the Halloween Spooktacular gets a hot stupidity injection as the gang chats about the final franchise entry to be released theatrically, Ernest Scared Stupid! Why aren't these parents doing more to keep their children away from Ernest? How is Ernest the only sanitation worker in this entire town? And what's with all the child kidnapping and peril in a supposedly family-friendly film? PLUS: A furniture malfunction sidetracks the guys for a few Dom Deluise-laugh-inducing seconds. Ernest Scared Stupid stars Jim Varney, Eartha Kitt, Austin Nagler, Shay Astar, and Jonas Moscartolo; directed by John Cherry.